Product #45985 | SKU T-PIN | 5.0 (based on 1 rating) Thanks for your rating! 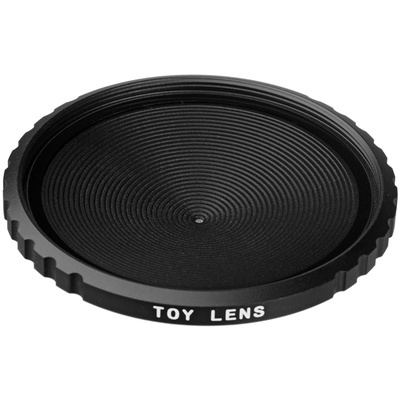 Reminiscent of one of the earliest photographic techniques and designed for Micro Four Thirds mirrorless cameras, SLR Magic's Toy Pinhole produces a unique image quality with strong noticeable vignetting and nearly infinite depth of field. Featuring a 12mm focal length, which is equivalent to 24mm in the 35mm format, this wide-angle pinhole has an approximate f/128 aperture and incorporates a protective glass covering over the pinhole to prevent dust from reaching the camera's sensor. Wide-angle, 24mm-equivalent focal length pinhole designed specifically for Micro Four Thirds mirrorless cameras. An approximate f/128 aperture helps to render nearly infinite depth of field. A protective glass covering prevents dust or other particles from reaching the camera's image sensor. Before purchasing the Pinhole Toy lens by SLR Magic, I was expecting a piece of plastic with a hole in the middle like the Wanderlust Pinwide lens, or the cheap $20 Pinholes on Ebay. Instead, I got a fully metal construction with a protective glass to keep dust off the sensor, and a 52mm thread for my wide angle lens, and filters.